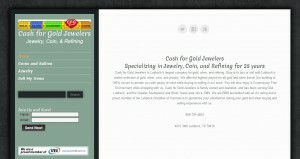 Cash For Gold Jewelers address, phone, website, hours of operation, and more. 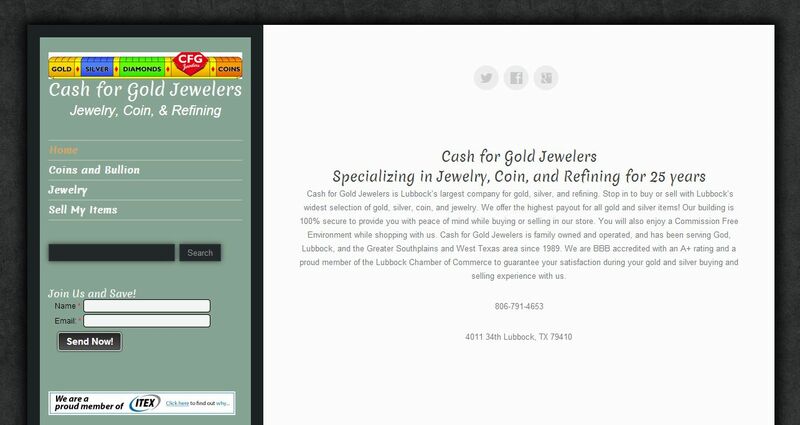 Cash for Gold Jewelers is Lubbock’s largest company for gold, silver, and refining. Stop in to buy or sell with Lubbock’s widest selection of gold, silver, coin, and jewelry. We offer the highest payout for all gold and silver items! Our building is 100% secure to provide you with peace of mind while buying or selling in our store. You will also enjoy a Commission Free Environment while shopping with us. Cash for Gold Jewelers is family owned and operated, and has been serving God, Lubbock, and the Greater Southplains and West Texas area since 1989. We are BBB accredited with an A+ rating and a proud member of the Lubbock Chamber of Commerce to guarantee your satisfaction during your gold and silver buying and selling experience with us.